This image of the child Jesus shows him as the Good Shepherd (Menino Jesus Bom Pastor, literally, ‘Jesus, the Good Shepherd Boy’) is a typically Portuguese Goan representation of Jesus. It shows him with his legs crossed and dozing peacefully at the top of a three-terraced hill that possibly represents the mountain of life. He holds a lamb on his knee and another is on his left shoulder. He wears a tunic, belt, and sandals. A gourd-shaped bottle is suspended from his belt. The lower section shows more sheep, drinking birds, a pair of resting tigers and a fountain with water flowing from the mouth of a tiger’s head. A resting female figure in a grotto and next to a crucifix is at the base. She rests with her hand on a book, a traditional way in Goa of depicting Santa Maria Madalena (Mary Magdalene). 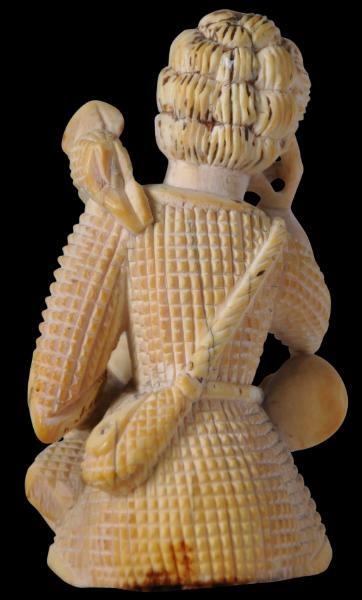 The back and sides of the image has small holes into which additional carved ivory flourishes to represent tree branches would have been inserted. Some images still retain this additional decoration; but many extant examples do not – see for example a very similar example in the Museum of Chaumont, France which is illustrated in Carreau (2009, p. 58). The image has a fine patina. There is colour variation between the front and back of the image, which is a helpful indicator of age. Remnants of polychrome remain on the image, particularly about the hair of the infant where black colouring is clearly evident. Christian ivories from India such as this example made their way as direct imports to Europe, particularly Spain and Portugal, where they entered the treasuries of churches and monasteries. Others were sent to Spain and Portugal’s dominions such as Mexico and the Philippines from where they might also have been exported to Europe. Others still entered aristocratic collections and European cabinets of curiosities as curios and collector’s pieces. Juana de Cordoba y Aragon, the Duchess of Frias, is known to have owned around fifty such pieces in 1604 (Trusted, 2007). Goa had a fractious history before coming under Portuguese control. It came under the governance of the Delhi Sultanate in 1312. But the Sultanate’s hold over the region was weak. By 1370, the region was surrendered to the Vijayanagara empire. The Vijayanagara monarchs held the territory until 1469, when it fell to the Bahmani sultans of Gulbarga. With the fall of that dynasty, the area fell to the Adil Shahis of Bijapur who established as their auxiliary capital the city known under the Portuguese as Velha Goa. In 1510, the Portuguese defeated the ruling Bijapur kings with the help of a local ally, Timayya. They founded a permanent settlement in Velha Goa (Old Goa). With the Portuguese, came Christianity. From the sixteenth century, Goa which formerly had been a remote province on the periphery of kingdoms, became an eastern trading capital of the Portuguese empire and the seat of Christian imperialism and influence whose influence stretched from the Cape of Good Hope to the Sea of Japan. The Portuguese expanded their possessions around the region so that by mid-18th century the area under occupation included most of Goa’s present day state limits. In 1843 the capital was moved to Panjim from Velha Goa. After India gained independence in 1947, Portugal refused to negotiate with India on the transfer of sovereignty of its Indian enclaves. In December 1961, the Indian army annexed Goa and several smaller Portuguese possessions, ending Portugal’s 400 year presence in the Indian sub-continent. Many Goans converted to Christianity under the Portuguese. Local religious art developed syncreatic elements: it was predominantly Christian but incorporated Hindu Indian influences. The Jesuits played a critical role in Goa: Francis Xavier, the Spanish-born pioneering Roman Catholic and co-founder of the Society of Jesus (the Jesuits) was ordered by Ignatius Loyola, the principal founder of the Jesuits, on behalf of the Portuguese king to undertake a mission to the Portuguese East Indies. The king had become concerned that Christian values in the possessions had become deteriorated. Xavier left Lisbon in April 1541, and after first visiting Mozambique he reached Goa in May 1542, where he spent the next three years strengthening the position of the Church. Thereafter, the Jesuits played a key role in developing the Church’s infrastructure in Goa: churches, monasteries and Catholic schools were built. 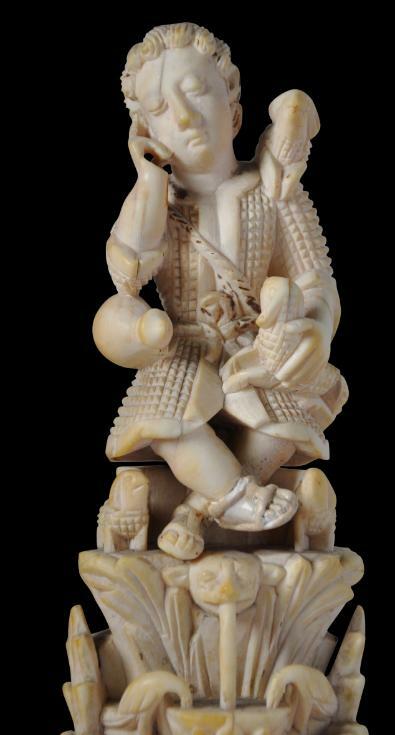 This carved ivory image is an excellent and increasingly scarce reminder of India’s complex, mixed heritage but also of a time when Portugal was a great seafaring and trading nation – a reminder that globalisation is hardly a new concept. Jesus Bom Pastor image in ivory in Lisbon’s Orient Museum, see Curvelo et al (2008, p. 46). This image is also attributed to 17th century Goa. The image has been carved in two sections: the infant, and his sitting platform. The two have been made separately and then joined (there are old glue remnants on the reverse.) The image is largely free of cracks and chips and is without repairs. Carreau, R., Devotion Baroque: Tresors du Musee de Chaumont, Somogy Editions D’Art, 2009.
et al, The Orient Museum, Lisbon, Reunion des Musees Nationaux, 2008.
et al, Encompassing the Globe: Portugal and the World in the 16th & 17th Centuries, Arthur M Sackler Gallery, 2007. Museum of Christian Art, ‘Museum of Christian Art’, 1993. Os Construtores do Oriente Portugues, Comissao Nacional Para as Comemoracoes dos Descobrimentos Portugueses, Porto,1998. Churches of Goa: Monumental Legacy, Oxford University Press, 2002.
et al, Ivory: A History and Collector’s Guide, Thames & Hudson, 1987. The Arts of Spain: Iberia and Latin America 1450-1700, V&A Publications, 2007.